Endometriosis. Ever since the word entered my vocabulary, a big unanswered question came with it. What causes it? Where does it come from? It’s difficult to find a solution to something when you don’t know the definitive cause, right? There are different theories out there on how cells that are similar to the endometrium end up outside the womb, but at this point there’s no absolute known cause. One of the main ideas is that of retrograde menstruation in which menstrual blood containing endometrial cells flows back through your fallopian tubes and out into the pelvic cavity, rather than out of your body. It has been shown that women with and without endometriosis have this happen. So, why do the cells stick in some and not others? Other studies claim that endometrial tissue was misplaced during fetal development, that later develops into endometriosis lesions. But again, why in some and not in others? What’s the cause? The authors concluded that endometriosis includes blood markers of inflammatory cytokines and tissue specific autoantibodies. They also point out that endometriosis frequently occurs with other conditions such as thyroid disease and inflammatory bowel disease. Another idea is that endometrial cells transport themselves through the lymphatic system. There’s a major lymphatic drainage point near your reproductive organs that can get stopped up if this system’s not flowing well. This makes sense to me too. Perhaps it’s a combination of all of these ideas, along with something else that’s not being tended to. Endometriosis: a symptom of something else? Earlier this week I began to piece things together and a new possibility rolled around in my mind… What if endometriosis is actually a symptom of something else? This possibility sprang to mind after reading Anthony William’s newest book, Medical Medium Thyroid Healing: The Truth behind Hashimoto’s, Graves’, Insomnia, Hypothyroidism, Thyroid Nodules & Epstein-Barr. He claims that EBV is the causative factor behind most mysterious chronic illnesses. EBV’s easily transmitted via bodily fluids and you may have caught it without even knowing it. You may have shrugged off your initial symptoms as a cold or the flu. William explained how in the virus’ early stages it goes after the reproductive system, because it feeds off of hormones. He says that EBV can cause cysts and fibroids. In later stages EBV makes its home in your liver, spleen and thyroid, because it feeds off of toxins and heavy metals. It starts to wear down these vital organs, all of which play a big role with endometriosis. When your liver gets worn down then your lymphatic system is impacted as well. When your lymphatic system gets clogged up then toxins, waste and hormones recirculate back into your body and the cycle continues. One of the most important lessons I’ve learned from Anthony William is that the theory of autoimmune conditions is false. Your body is not attacking itself. Your body wants to find balance and protect you from harmful invaders. The immune system reaction that goes on with “autoimmune” conditions is your immune system fighting off the virus. It’s going after EBV. The antibodies are there in response to a viral attack. The inflammatory reaction that happens comes from the virus, not from your body attacking its own tissues. The Epstein Barr Virus & Endometriosis? 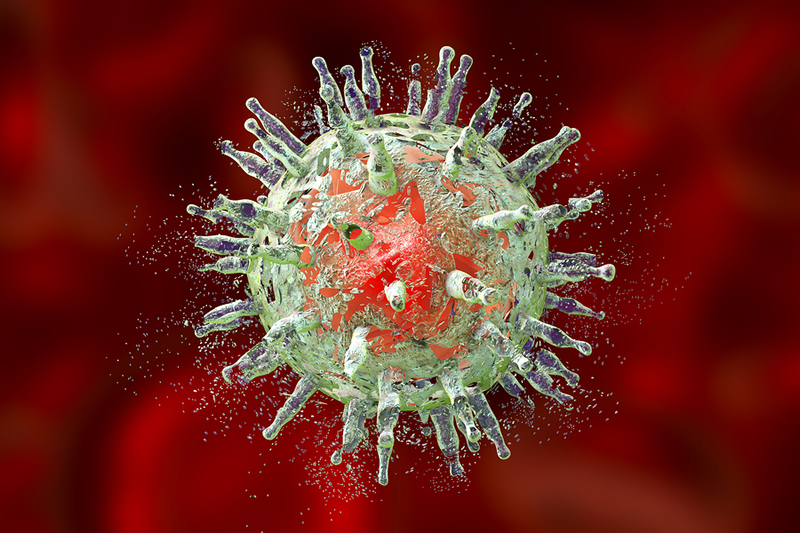 EBV’s a smart and evolving virus that does a number on your immune system. As it grows and prospers it does more and more damage to your body. In the later stages it starts to impact your nervous system showing up as fibromyalgia, chronic fatigue syndrome, multiple sclerosis, rheumatoid arthritis, thyroid disorders, lupus, Lyme disease, tinnitus, vertigo and more. I haven’t seen or heard Anthony William connect it with endometriosis, but I have an inkling that’s the case. Since I didn’t hear back, I’m assuming, they don’t know the answer either. Maybe the question will spark a future blog post or podcast by Anthony William? One can hope. In the meantime, I can’t stop thinking about this potential connection with endometriosis and EBV, one that I’ve always wondered about. Shortly after Thanksgiving my mom got really sick and was diagnosed with pneumonia. She was feeling really run down. “I feel like how I did when I had mono,” she said. “You had mono?” I asked. Well, that’s good to know. Ding, ding, ding! William says that EBV can be passed down from your parents, so you’re born with the virus in your system. Seems that was the case for me. Armed with this new knowledge I could see how EBV has played a key role in the decline of my health over the course of my life. As mentioned, EBV feeds off heavy metals and toxins. It also thrives when it’s given eggs, dairy, corn, wheat, and pork. These are all foods that I ate a lot of as a kid. I drank milk three to four times a day on top of cheese, ice cream and lots of wheat. I fed the virus well. As I grew up, new chemicals were introduced to the food supply along with genetically modified foods. All of these added to the growth of EBV in my body. I struggled with painful periods from the start. I also had issues with my tonsils for as long as I can remember. Whenever I got sick my throat would hurt terribly. This got worse after I was officially diagnosed with mono or glandular fever (the second stage of EBV) when I was 15. Since then my tonsils and glands in my throat have always been swollen. When I was 17 I started taking birth control pills, which I took for the next decade of my life. Little did I know then that EBV feeds off hormones! The synthetic hormones in birth control pills and in many of the hormonal treatments offered for endometriosis are not easily processed out of your body and they wear down your liver. So, the chemical hormones linger in your body and serve as fuel for EBV. As I read through Medical Medium: Thyroid Healing, I was reminded how EBV can lay dormant for years, silently building up its forces. It strikes when the immune system is already weakened due to major stress or a large influx of hormones that comes after giving birth, for example. That’s why many ladies start to have thyroid issues after they have kids. The stress from child birth and the huge influx of hormones serves as a perfect situation for EBV to thrive. EBV also feeds off excess adrenaline, so it flares up from stress. Thinking back on my own life and when things got really bad with my health was a point when I was under a great amount of stress physically, emotionally and environmentally. It was the perfect mix for EBV to make itself known. I got off the pill when I was 27 and the pain started to progress again with my periods. At the time I was living in a condo right off a major highway and across the street from a landfill. Underneath us lived a crazy angry neighbor who threatened our lives on many occasions, creating a stressful living environment. All of this was mixed with the fact that I was going to school to get a master’s degree and working full time. I took little time for myself. I literally burnt myself out and things steadily declined with my health. My periods were excruciating. This eventually led to finally being diagnosed with endometriosis when I was 29. A couple of years later I was diagnosed with Hashimoto’s. I began to have aches and pains in my joints and could feel that my lymph nodes were almost always swollen. I had migraines, tingling in my extremities, dizziness, heart palpitations, foggy thinking and constant fatigue no matter how much I slept. All of these symptoms, William claims, are from late stages of EBV. So, after reading all of the Medical Medium books and seeing the connections again and again with EBV and other “autoimmune” conditions, I can’t help but connect this with the endometriosis in my body. Perhaps the endo is living in these spots because my immune system was weakened by EBV my whole life and not taking care of them. Those cells then are serving as fuel for EBV, which causes further inflammation and pain. Perhaps the elevated cytokines found with endometriosis are a sign of the immune system tending to EBV. Perhaps it’s the virus causing all the inflammation and it’s feeding off endometrial cells because they’re full of hormones? Maybe that’s why the stray endometrial cells are similar to those found in the uterus but not exactly the same? EBV has been living in my liver for who knows how long, messing with it’s ability to release toxins and synthetic hormones. Once my liver got wore out it went to work on my lymphatic system, which is always swollen, I can feel the blockages under my skin. If endo is spreading this way, maybe it’s getting stuck and re-circulating? I felt better with endometriosis once I followed the “endo diet”, which makes sense since the foods on the avoid list are all those that feed EBV! Ding, ding, ding! (If you want to get started with the endo diet check out my free course: Endo Diet Jump-start). If the virus is a causative factor then it makes even more sense why the holistic path is the way to go. Adding in synthetic hormones of any kind only adds to the fire. They wear down your liver and feed EBV. It also would explain why stress can be such a big trigger for pain. The Medical Medium books have helped me tremendously over the past year. I’m living with less pain, more energy and hope that this will continue. My plan moving forward is to continue to follow the Medical Medium protocol for killing off EBV. I’m going after the virus. I believe this is the source of it all. I’m grateful that I’ve been connected with this information and I hope that it serves as insight for you. Your body wants to heal, and please know it’s possible. It does take time, however. Considering I’ve been sick my whole life, it takes a while to turn that ship around. I do believe that there are different layers to healing and that endometriosis is a complex dis-ease. While EBV attacks the physical, I do think there are other emotional and spiritual components that must be addressed as well. I’ll be going deeper into these topics in the next couple of weeks, and in my upcoming book, Energetics of Endo so stay tuned! Have you ever had mono? Do you have any other immune system conditions besides endometriosis? Have you followed the Medical Medium protocol for killing off EBV? Thank you for making this helpful website! Can you tell me what the protocol is for killing EBV? Wow you sound exactly like me!!!! Tons of throat infections, mono, the pill at 17 for exactly a decade, Hashimoto s after I had kids, I mean everything! What you are saying totally makes sense! Good to hear it helped you piece things together too, love. Best of luck on your journey. Wow! Mind blown! Fantastic theory. I look back at my childhood and think of the chemical exposures I had through food and environment added with stress and this is just another piece of the puzzle. Now, to become a scientist and explore this further……. Yes! I hope Anthony William’s books inspire some scientists to look into this further. Unfortunately with the power of the pharmaceutical companies, the system isn’t really into getting you better. This fits me perfectly I had glandular fever in my late teens quite , I suffered with an under active thyroid after my first child, I have recently been under a great deal of stress that’s caused me to loose a stone and a half in weight within 6 weeks during this time I also had a bad flare up of my endo whilst on prostrap (Lupron) I also have mirena fitted. Reading what you have written here immediately made everything fit into place. Happy to hear it served you Shell. I hope this helps you take the first steps to feeling better. Sending lots of love. Thanks, love. I hope this helps you piece some things together. Hi Aubree, I have read Anthony Williams first book and following the protocols for EBV are a work in progress for me, although my challenges are also ms and vulvodynia some psoriasis and Endo-a lot. Anthony also links ms to the EBV which I had read about before. Have you done liver flushes recently as part of your cleansing? I read about your experience with them before which goes with detox in general I guess. Best wishes to you. Thanks Aubree, I agree re the celery juice I have been doing this on and off and I definitely feel better for it. Buying organic and in bulk as able. The flushes you do need a strong stomach and I admire your strength in doing the amount of them that you did, certainly not the easy route to healing. Best wishes. Awesome. Good to hear the celery is helping you too. I wish you the best too, love. Hi Amanda. I’ve read his books and listened to his podcasts and didn’t get the sense that he advocates everyone to eat a vegan diet. I know for me that’s not sustainable. What parts of his protocol have you tried? Remember it takes time for your body to heal, especially if you’re like me and have an advanced stage of EBV. Sending lots of love. You are the best!! Great connection, I did not hace mono but I’ll check for other inmunne conditions. Count me in, I’ll check with doctors here in Argentina. Thanks thanks for your clarity. Kisses!! Thanks, love. Best of luck on your journey. I wasn’t able to have my endometriomas start shrinking until I followed his No Foods advice all the way to no eggs. I resisted that one for a long time. I also wonder if strep might be part of the picture. I was considered a “step carrier” when I was young. That’s great that you’ve seen results shrinking your endometriomas! I’ve recently cut the eggs too. I was eating them quite frequently. I’m trying to avoid the corn now. That’s tricky for me. I LOVE Mexican food. Hi. Is it ok if you share your process? What’s on the no food list? Thanks. Hi Shannon. The “no” foods are wheat/barely/rye (gluten), dairy, soy, corn, eggs, MSG, and other chemical additives. Thanks Stephanie. I have written about this before, but am feeling pumped up again about it after reading his newest book. This sounds so like me. Thanks for sharing. I had mono and still struggling with extreme migraines since age 16. I am 43 now. I also have the other symptoms mentioned. I am definitely checking this out 🤔😱. I am going to the neurologist next month, hoping now I finally get approved for Botox as I have tried everything else available. My IBS is difficult to fix but I think the fatigue will be less when I don’t have to struggle with migraines as well. I’m happy it helped you make some connections Rosalina. It’s possible to feel better, love. Hi Aubree. I really enjoyed reading this. Thank you, where endo came from is something I want the answer to. I had glandular fever at 16 and my health was awful for years. I have been in and out of hospital not just for endo but also migranes and other neurological issues including numbness. I also had shingles a few years ago and think that is linked to glandular fever as well. Thanks Aubree. I think I may need to add this book to my tablet!! Thanks Pamela. It sounds like EBV’s factor for you too. Definitely pick up Medical Medium’s books. He has changed my life because he changed my perception about everything. This is interesting. I had mono when I turned 16, and like a light switch, I started having painful periods. I remember it like it was yesterday. I never had pain before. I was then diagnosed at age 22 with stage 4 Endo. I often wondered about the connection. Keep up the research. Interesting indeed. It sounds like many have a similar story. Been also wondering this myself for a few years now after getting very very ill for nearly 8 weeks only to find I had off the chart levels of reactivated EBV. I have an array of health issues now and started having symptoms of Endo in my teens along with my mother who was diagnosed with Endo in her 30’s. I was diagnosed at age 29, I’m 44 now. On top of chronic Sciatica, Raynauds syndrome,and other issues,in the past year I developed severe migraines and Seizures. Currently undergoing more tests to fully diagnose what is believed to be myoclonic and temporal lobe seizures. The migraines and seizures seem to escalate during spikes of estrogen in my monthly cycle. Anyway… I strongly believe there is a link here and it very well could be EBV. Yes! Definitely check out Medical Medium’s books if you haven’t already. He really helped me to confirm the connection with EBV, something I’ve intuitively always known. I just listened to the entire thing. He doesn’t really start getting into what causes endo and what we can do to heal until 36-37 minutes into it. Here are the takeaways I got: endometrial cells are kicked out of the uterus through its lining because they are too toxic. They become toxic because of things like heavy metals, pesticides, chemicals in our products and foods etc. Once they are outside of the uterus, pathogens in our body love to feed off of them, which exacerbates the problem. I did listen. SO interesting, right? My theories were on the right track. Thanks for sharing, love. He specifically talks about endo in the Life Changing Foods book. He mentions it once or twice in the Thyroid Healing book. In Thyroid Healing, he also has 3 difference cleanses that he recommends, totaling 90 days. I am about to embark on that, for endo. They all involve celery juice! Thanks, love. It sounds like you’re on the right track now to healing. Please let me know if I can support you further. I am following Anthony and his Endo diet and I have had 3 painfree periods the last 3 months, so I am a huge fan. However, I am looking to connect with more women who has done Anthony’s protocole and healed 100% from Endo, have you got anyone in your community that you are aware of? Hi Jenny. So glad you’re having success following Anthony’s protocol. I am doing much better too! I don’t know anyone who has healed 100% but I don’t think the information’s been out there long enough for that to happen. Healing takes time. Much Love. Thank you for the article. Same story at my side and came up to the same conclusion after listening to most Medical Medium lectures and reading his books. Epstein Barr virus is the culprit for sure. I had endo, vertigo and been on the sensitive side all my life. I follow MM advice celery juice in the morning and on/off on the anti virus protocol which involves lemon balm, cat’s claw and licorice root tinctures. I feel better since I took my health in my own hands and did a lot of studying. Good to hear that you’re making changes. Medical Medium’s advice has helped me so much!